On July 19, the Nimblewill Nomad again shouldered his pack and headed back out to thru-hike the second trail planned for this year's 2010 Odyssey. 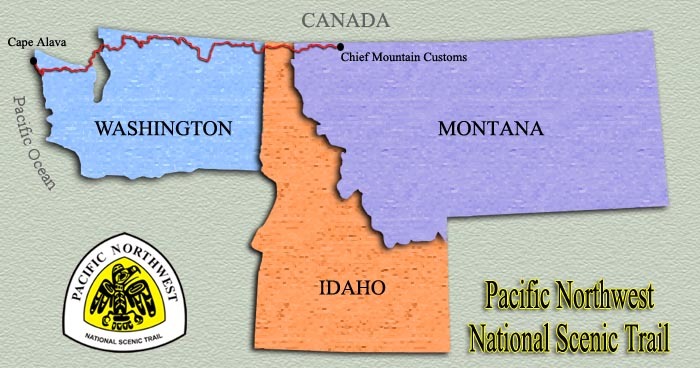 This journey will be 'oer the Pacific Northwest National Scenic Trail, which runs along the US-Canadian border from Chief Mountain Customs, in Montana, through the northern panhandle of Idaho, to Cape Alava, Washington, on the coast of the Pacific Ocean. The trails route was first conceived and explored by Ron Strickland in 1970. In 1977, Strickland founded the Pacific Northwest Trail Association (PNTA), the organization that oversees education, maintenance, and fund-raising for the PNT. On March 30, 2009 the Omnibus Public Land Management Act of 2009 included the addition of the PNT as a national scenic trail, and named the Department of Agriculture as administrator of the trail. In an article titled The New Northwest Passage, written by Ron Strickland, a portion of his description states, "Stretching from the Continental Divide to the sea, the Pacific Northwest Trail (PNT) hearkens back to the Northwest Passage, that fabled gateway to the east sought by explorers of old. This 1200-mile route, however, doesn't lead to gold or furs but something infinitely more valuable—true adventure. The PNT links Glacier National Park in Montana with the northwestmost point of the Olympic Peninsula at Cape Alava, Washington. Deliberately designed for high-altitude enthusiasts, the trail offers superb scenery, solitude, and geographic diversity as it traverses mountain range after mountain range. En route, you'll cross the Rockies, the Purcells, the Selkirks and the North Cascades; meander through the Salmon-Priest, Okanogan, and Pasayten Wildernesses; climb through the North Cascades and Olympic National Parks; and dip your toes in the water of the Columbia River, Puget Sound, and the Pacific Ocean." The Nomad, a devout and seasoned thru-hiker, is always ready to answer the call to be one with God's Nature, to see and feel such a vast variety of sights and experiences for himself, and to share them with you. So, if you're not lacing up your bootstraps to hit the trail yourself, then sit back, relax, and enjoy hiking along the PNT with the Nimblewill Nomad, through the photos, videos, and written journal entries he will post along the way. 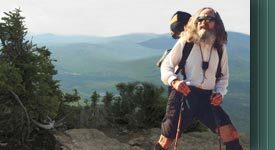 Although the Nomad began this trek as a lone hiker, with van support from his long-time friend Gordon Smith, 10 days out on the trail his path crossed with a fellow thru-hiker named John Mother Nature's Son Calhoun. The two have since been hiking the rest of the PNT together.